ICICI Bank share prices are under performing nifty from past one year. Now the price action is totally different from Nifty. Share prices fell from 270.00-240.00 between end of July and beginning of August. Weakness in Asset quality and earnings, rising NPA are main reasons behind the sell off. Due to recent turmoil in banking sector, Institutional investors are avoiding banking stocks with high debt burden and NPA. The fears about further loss of Price earnings and deterioration of performance are contributing to the pessimistic attitude. Price action started consolidating at the end of July due to month end flows and profit taking liquidity. The prior performance was intact with Nifty but after market failed to break July Highs the sentiment turned pessimistic and contributed to downfall. Initially price action broke the support level 260.00. During the process of breakout, we can notice that Market has gapped down. From the perspective of lower time frame the breakout consist of climatic pattern. The structure trapped many traders. Liquidation of these weak hand players in turn accelerated the selloff. After touching 237.15, prices bounced upside indicating the buying pressure. Market has again stalled within a minor range between 250.00 -237.00. Traders should see how selling pressure reacts when price action tests resistance levels. Is It a Pullback or Pullback Failure? Through Market structure analysis, we can get more clarity about the present situation. 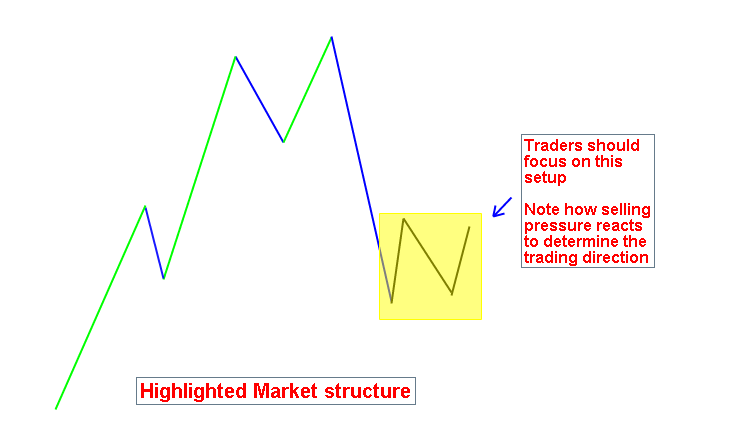 Kindly see the Highlighted Market structure on recent trading setup. Technically the resulting price action can either be Pullback or Pullback Failure and the setup is quite ideal for swing trading. Traders should focus on the setup and watch closely how selling pressure reacts as it will help to decide the trading direction and make valid trading decisions. 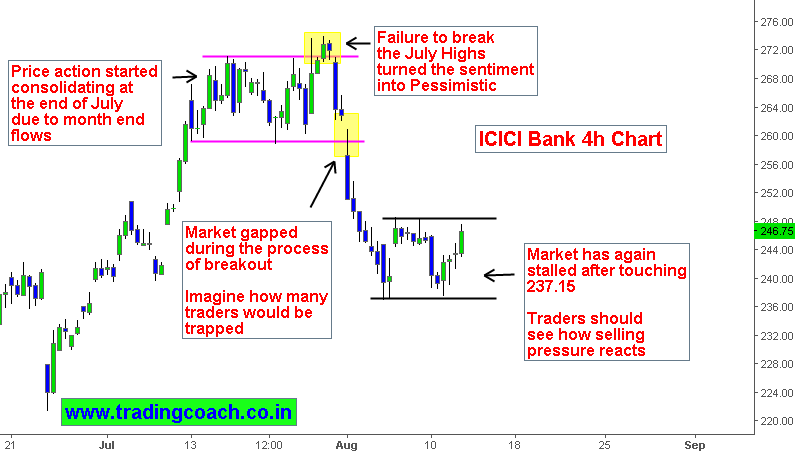 ICICI Bank Price Action – Upswing is challenging the Downtrend. Crude Oil | Is Market trading in distribution phase?